Remove front drive shafts. Refer to FAX-18, "6M/T : Removal and Installation (LH)". Remove differential side oil seals (1) from clutch housing and transaxle case using a suitable tool. Do not damage transaxle case and clutch housing. Install differential side oil seals (1) to clutch housing and transaxle case, using Tools. Do not incline differential side oil seal. Do not damage clutch housing and transaxle case. Check the oil level and oil leaks. Refer to TM-19, "Inspection". Disconnect position switch harness connector. 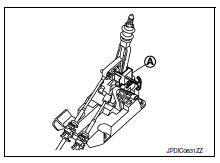 Remove position switch from transaxle case. Apply recommended sealant to threads of position switch. Use Genuine Liquid Gasket, Three Bond 1215 or an equivalent. Refer to GI-21, "Recommended Chemical Products and Sealants". Remove old sealant and oil adhering to threads. 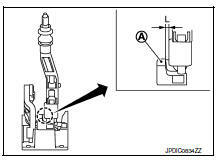 Install position switch to transaxle case. Tighten position switch to the specified torque. Refer to TM-30, "Exploded View". For the next step and after, install in the reverse order of removal. Check continuity between position switch terminals. Refer to TM-17, "BACK-UP LAMP SWITCH : Component Inspection" (Back-up lamp switch) and TM-17, "PARK/NEUTRAL POSITION (PNP) SWITCH : Component Inspection" (PNP switch). Check the oil leaks. Refer to TM-19, "Inspection". Move the shift selector to the neutral position. Remove air cleaner case assembly. Refer to em-25, "removal and installation". Remove the battery tray and battery support brackets. Refer to pg-51, "removal and installation (battery bracket)". Disconnect the each cable from the shifter lever a (b) and the selector lever (a) using a suitable tool. While pressing the lock of the selector cable in the direction of the arrow shown, remove the selector cable from the m/t cable bracket. 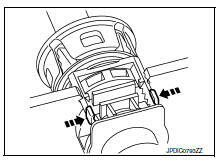 While pressing the lock of the shifter cable in the direction of the arrow shown, remove the shifter cable from the m/t cable bracket. Remove m/t cable bracket from transaxle case. 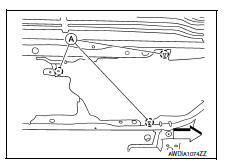 Remove the cvt/mt shift selector finisher (1). Remove cluster lid c. Refer to ip-20, "removal and installation - cluster lid c lower". 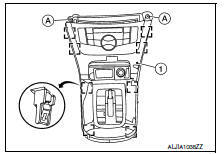 Remove the CVT/MT shift selector screws (A). Release the clips using a suitable tool, then remove the CVT/MT shift selector finisher. Pull up the cable stopper (a) of the selector cable in the direction of the arrow as shown. Pull out and disconnect the selector cable from the pin of the shift selector assembly, using a suitable tool. 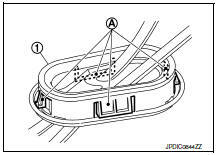 While pressing the lock of the selector cable in the direction of the arrow shown, remove the selector cable from the shift selector assembly. 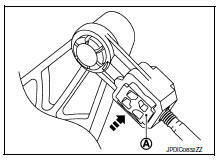 While pressing the lock of the shifter cable in the direction of the arrow shown, remove the shifter cable from the shift selector assembly. Remove the shift selector assembly. Remove exhaust front tube and sub muffler. Refer to ex-5, "removal and installation". Remove the shift cable and selector cable from the bracket. 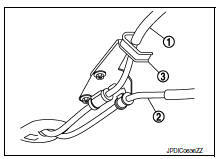 Disengage the pawls (a) of the grommet (1), and pull downwards to remove. Remove the shifter cable and selector cable from the vehicle. Install each cable without causing interference with other parts, a 120 mm (4.72 in)-or-less bend, and a 180-degrees-or-more twist. Install boot of each cable without causing interference with other parts and a 90-degrees-or-more twist. Fit boot of to center console assembly the groove on shift selector knob. To install the shift selector knob, press it into the shift selector. Do not reuse shift selector knob. Be careful with orientation of shift selector knob. Do not reuse tapping bolt. Insert the each cable until it reaches the cable mounting bracket and shift selector assembly. Insert the each cable until it reaches the shifter lever A and the selector lever. Install the shifter cable (1) and the selector cable (2) to the bracket (3) as shown. 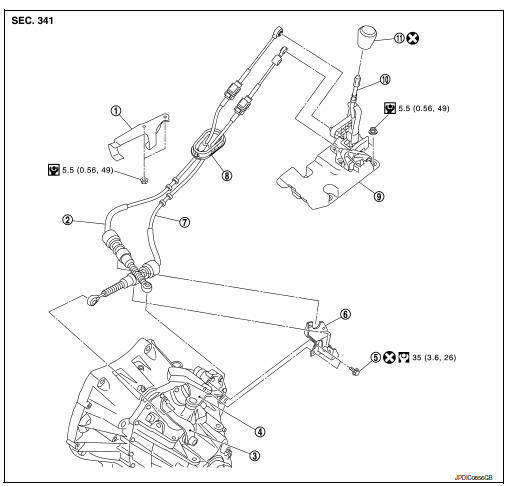 Install the selector cable (the shift selector assembly side), as per the following procedure. Install the selector cable to the shift selector assembly. 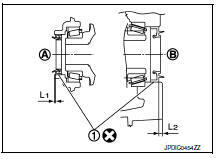 Install the shift selector stopper (A) to the shift selector assembly as shown. Selector cable cannot be adjusted accurately without using the shift selector stopper. Check that the shift selector does not move in a back and forth direction. If it moves, repeat the installation of the shift selector stopper to the shift selector assembly. Insert the cable stopper (A) until it reaches the selector cable. 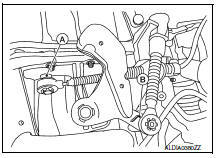 Remove the shift selector stopper from the shift selector assembly. Move the shift selector to each gear position to check that there are no bindings. 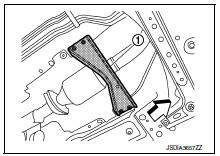 If any, repeat the installation of the shift selector stopper to the shift selector assembly. Move the shift selector to the 4th gear position. Adjust the length (L) between the cable stopper (A) and the shift selector to the standard value. Insert the stopper (A) until it reaches the selector cable. Move the shift selector to each gear position to check that there are no bindings. If any, repeat the adjustment of the length between the cable stopper and the shift selector. Check that the shift selector knob is installed in the right position. Pull each cable in the removal direction to check that it dose not disconnect from the cable mounting bracket. Pull each cable in the removal direction to check that it dose not disconnect from the shift selector assembly. 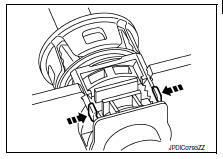 Pull grommet in the removal direction to check that it dose not disconnect from the vehicle. Check that there is no tangle, hook, abnormal sound, looseness, and interference when the shifter selector is moved to each position. If there is a malfunction, then repair or replace the malfunctioning part. Check that the shifter selector smoothly returns to the neutral position after moving the shift selector from 1st to 2nd gear and moving hands off the shift selector. If there is a malfunction, then repair or replace the malfunctioning part. Check that the shift selector smoothly returns to the neutral position after moving the lever from 5th to 6th gear and moving hands off the shift selector. If there is a malfunction, then repair or replace the malfunctioning part. Remove air breather hose from the 2 way connector. When removing air breather hose, be sure to hold 2 way connector securely. Install air breather hose, preventing crush and clogging caused by bending. Insert the allowance of air breather hose to the spool of the 2 way connector. 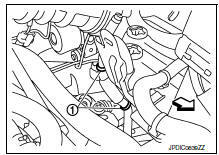 Install air breather hose to the 2 way connector with the paint mark faced forward of the vehicle. Securely engage the clips in the hole.